Apartment rents declined in some of the country’s priciest cities during the third quarter, a dramatic reversal that could signal the end of a six-year boom for the U.S. rental market. Rents in San Francisco declined 3%, while they fell about 1% in New York and edged lower in Houston and San Jose, Calif., the first drops in those markets since 2010, according to apartment tracker MPF Research. Across the U.S., rent growth was 4.1% on average. According to a report by Axiometrics Inc., growth in the U.S., slowed to 3% in the third quarter from 5.2% in the year-earlier period. The rate remains above the long-term average of about 2%, the report said. But rent increases have slowed for four straight quarters and turned negative in key regions, suggesting the overall market could be headed lower. 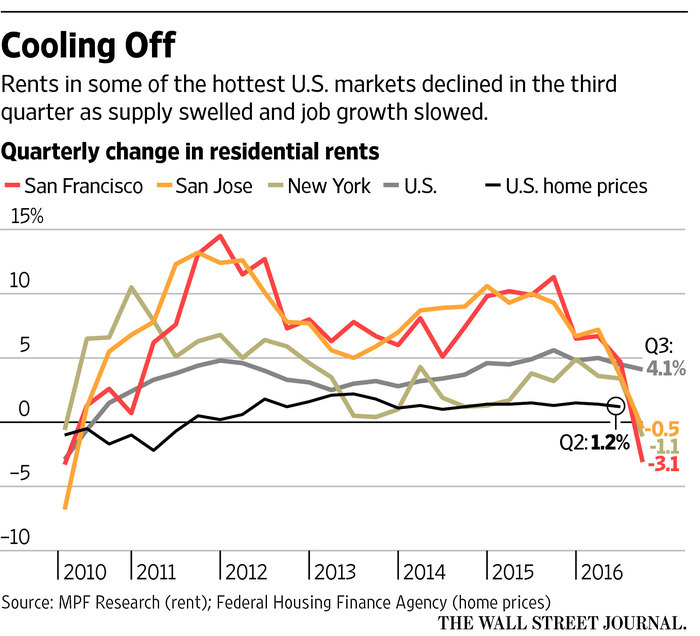 The rental market is coming off its biggest boom in decades. The foreclosure crisis, along with a trend toward urban living, has created seven million new renter households since the housing-market peak in 2006, as the homeownership rate declined to 51-year lows. Apartment developers have flocked to downtown locations, catering to affluent young professionals willing to devote bigger chunks of their incomes to rent to be near restaurants and shops. Across the country, rents have jumped 22% in urban areas since 2010, according to Axiometrics. High-end apartments now command a 45% premium over older ones, while historically they have fetched about a third more, according to MPF. But the same downtown areas that drove the boom are now the deepest pockets of weakness. “You’re going to see red right in the middle of every market. That’s the one place where supply and demand are out of balance,” said Jay Denton, senior vice president of analytics for Axiometrics. Some slices of the market are stronger. Rents for midprice apartments across the U.S. are still up 4.9% from the year before, according to MPF. More affordable cities are seeing some of the strongest rent growth. Rents in Sacramento shot up 12% in the third quarter, while in Riverside, Calif., they jumped 7.9%, according to Axiometrics. The single-family home market has been strong as well. After plunging 27% from 2006 to 2012, the S&P CoreLogic Case-Shiller national home price index has surged to within 0.6% of its record high. 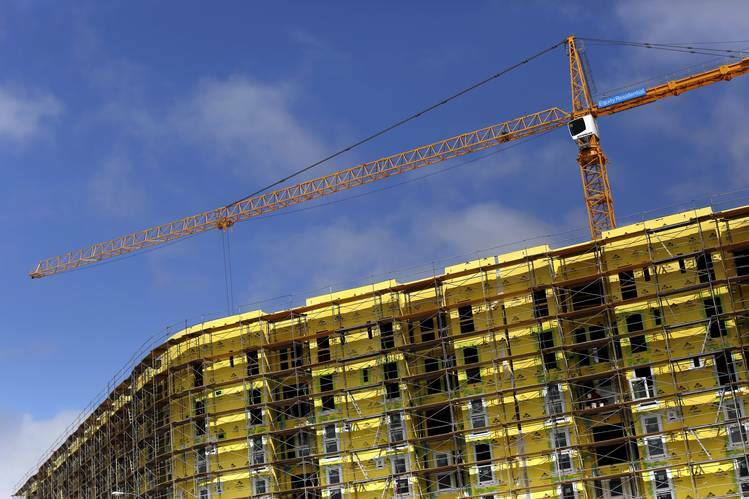 The main cause of the rent slowdown is a flood of new supply, with more than 555,000 units under construction across the 100 largest U.S. metro areas, according to MPF. Tenants also are beginning to tighten their purse strings as rents have jumped by as much as 60% in some markets since 2010. Growth of high-paying jobs, meanwhile, is slowing in New York, San Francisco and nearby Silicon Valley. Almost 6,700 additional apartments are expected to be built in San Jose and nearly 6,500 more in San Francisco by the end of 2018, according to Axiometrics. New York is expected to get more than 42,000 new units during that same period. At the same time, job growth is losing steam in some major cities. San Francisco added 26,000 new jobs in August 2016, about half the 47,000 jobs it added in the year-earlier period, according to an analysis of Bureau of Labor Statistics data by Mr. Rosen. Silicon Valley—the area south of San Francisco that is home large technology companies like Google parent Alphabet and Facebook Inc.— created 38,000 jobs in August, down from 54,000 jobs a year earlier. In San Jose, buildings such as the Ascent, which opened in September 2015 with one-bedroom units starting around $2,500, are now offering new tenants two months of free rent. Eugene Korsunsky, president of Intempus Realty, a San Jose real-estate brokerage firm that manages apartments and single-family homes for landlords, said for the past couple of years apartments sat on the market for about a week. Now it can take him nearly a month to find a tenant, he said. “We’ve actually had to drop the rent on some properties, which I don’t think I’ve ever done in my career,” he said. Tenants are even gaining the upper hand on renewals. Landlords typically drive a harder bargain on such leases because they know residents would rather avoid the hassle of moving. Himanshu Khandelwal, a 24-year-old software engineer at Cisco Systems Inc., negotiated a discount when he renewed his lease for a three-bedroom house near San Jose that he rents with roommates. With the lease set to expire at the end of August, Mr. Khandelwal and his roommates looked around and found that comparable places were cheaper than theirs. The landlord agreed to knock $50 a month off the rent, roughly a 2% discount. In New York, a number of properties are offering two months of free rent, including a Bjarke Ingels-designed project on Manhattan’s west side, which faces competition from dozens of others opening in Manhattan, Brooklyn, Queens and Jersey City, N.J.
A 440 square foot studio in the building leases for $3,700 a month, steep even by New York standards. Dan Mogolesko, vice president residential leasing and operations for the Durst Organization, which developed the property, said he still gets upward of 100 calls a day from interested tenants and brokers. But getting those callers to sign a lease is growing more challenging. “A lot of large developers that have a lot of property are certainly being impacted by this tremendous amount of supply,” he said. Few large urban developers have said they are canceling projects in the pipeline, but permits for new projects are down. A slowdown in new construction could help stabilize the market by 2018 or 2019, but by then, economists said, there is a greater chance of recession.